Another Item in the Eponymous Epicurean Delights Series . . . The Cornish Pasty is descended from centuries of food traditions related to encapsulating fillings in pastry. Nowadays, the word "pasty" (pronounced \ˈpas-tē\) usually refers to a small or medium sized meat-filled pastry turnover. However, their history shows that they came in many different forms throughout the years. Pasties and pies are related but different. 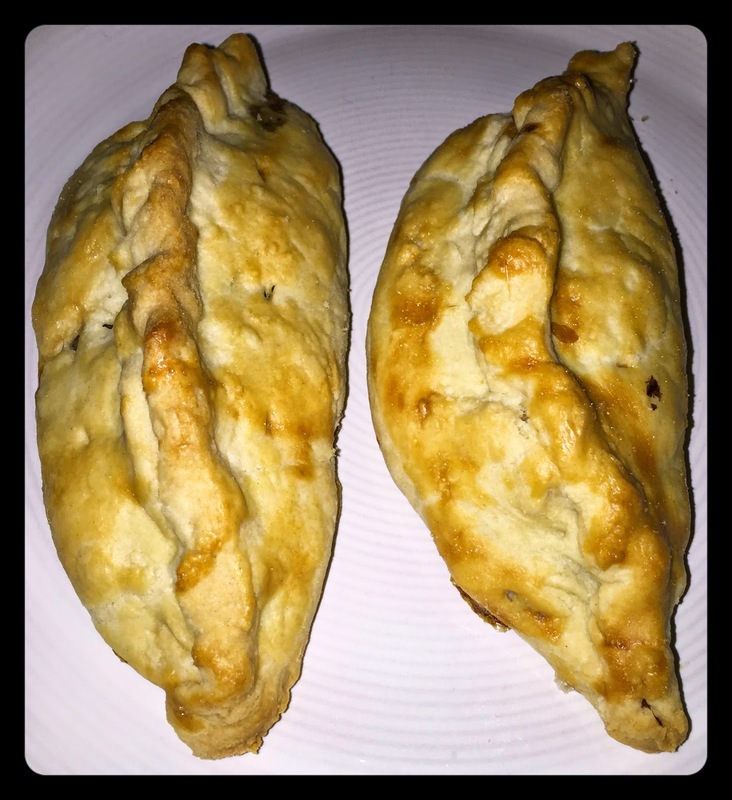 In the Middle Ages, pasties could be very large and often referred to meat or fish enclosed in a pastry case without the help of a mould or exterior dish. Medieval pasties could have also been enormous because it was not uncommon for them to contain whole joints of meats. On the other hand, pies referred to a mixture of ingredients contained within the pastry and were made in raised forms rather than as a turnovers which was standard for pasties. To further complicate things, Medieval pasties could also be made from a mixture of sweet ingredients such as raisins, sugar, and eggs, almonds, apples, pears, etc. In the 16th century, the word Chewet also referred to a type of pasty that contained various meats, fish, dried fruits, and/or spices. Chewets were made in a small enough form to be considered finger food for banquets. For example, in The Good Housewife's Handmaide for the Kitchen (1594) there is a recipe "To make chewets of veale." Another reference to chewets in the 16th century comes from a satirical ballad, The Image of Hypocrisy, in which there is a section about cardinals; it reads cardinals " . . .wallow bestially As hogs do in a sty, Serving their god, their belly, With chewets and with jelly, with Venison and with tarts And portingale farts To ease their holy hearts ." Clearly pasty history is extensive; however, the Cornish Pasty has only been popular for about the last two hundred years. By the 18th century it was established as a Cornish food by poor working class people who could only afford ingredients such as potato, turnip (swede), and onions. Cheap cuts of beef were added later. One of the earliest records of a specific type of pasty in Cornwall goes back to 1808 when it was mentioned in Worgan's Agricultural Survey. The early 19th century burgeoning industrial economy of Cornwall (located in the Southwestern corner of England) influenced the region's reliance upon this eponymous food because the pasty was portable and therefore convenient to bring down into the tin mines. Also, the Cornish pasty is made in a distinctive D-shape with a crimped pastry edge that could be used as a handle. Supposedly, this pastry-dense handle was discarded because the arsenic in the mines could settle within it (not sure if this is a myth though). Pasties are a good food in a region reliant upon a precarious industrial mining economy that could be so easily affected by market prices; in prosperous times lots of meat could be used but in poorer times more vegetables could be used. These individual hand-held meals were also quite convenient for satisfying picky eaters. Each could be filled according to the taste of its future eater, thus each person's pasty was traditionally marked with their initials. Finally, one Cornish pasty could serve as both main dish and dessert because one end of it might be filled with meat while the other end with a sweet such as apple. Source: English Food by Jane Grigson. Penguin Books, 1974. Make the shortcrust pastry in the usual way. Do not be tempted to use butter or any other kind of fat, because lard gives the right flavor and texture to the crust. Leave the pastry in a cool place for an hour to rest. Meanwhile remove the lean meat from the skin, gristle, etc., and chop it with a sharp, heavy knife. There should be a generous half pound (the trimmings can be kept for stock-making). Mix the meat with the vegetables and seasoning. 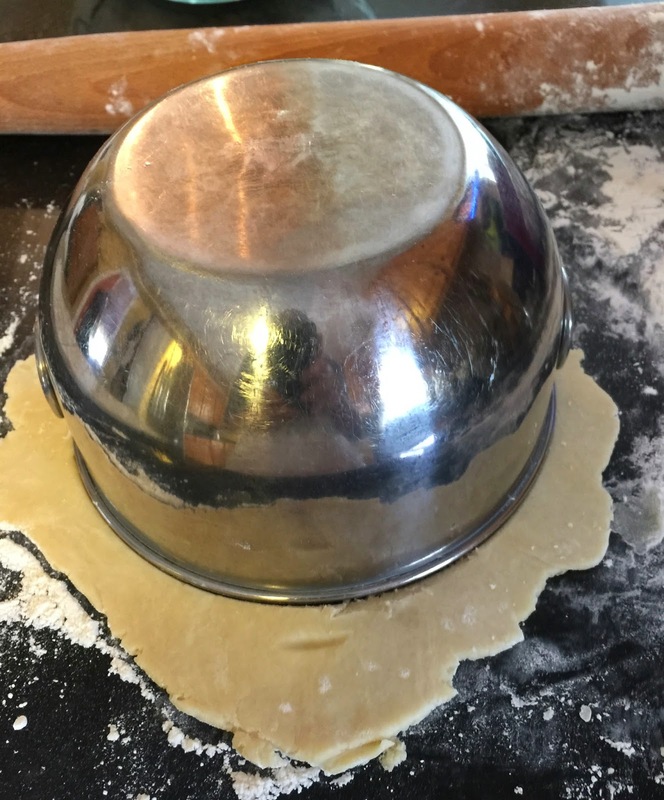 Using a bowl to make pasty circles. Roll out the pastry and cut it into two large dinner-plate circles. 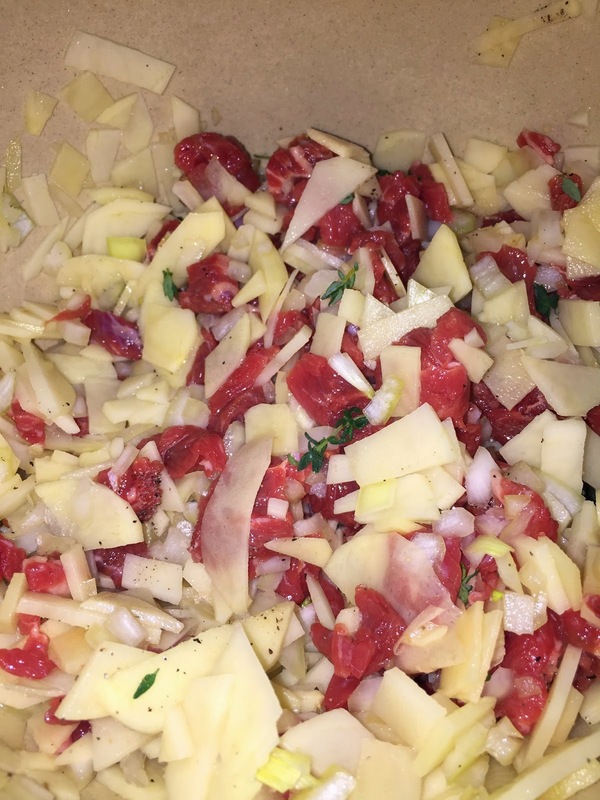 Divide the steak mixture between the two, putting it down the middle. Brush the rim of the pastry with beaten egg. Bring up the two sides of pastry to meet over the top of the filling, and pinch them together into a scalloped crest going right over the top of the pasty. Make two holes on top, either side of the crest so that steam can escape. Place the pasties on a baking sheet and brush them over with beaten egg. Bake at mark 6, 400º, for 20 minutes. Then lower the heat to 350º, for a further 40 minutes. Serve hot or cold. 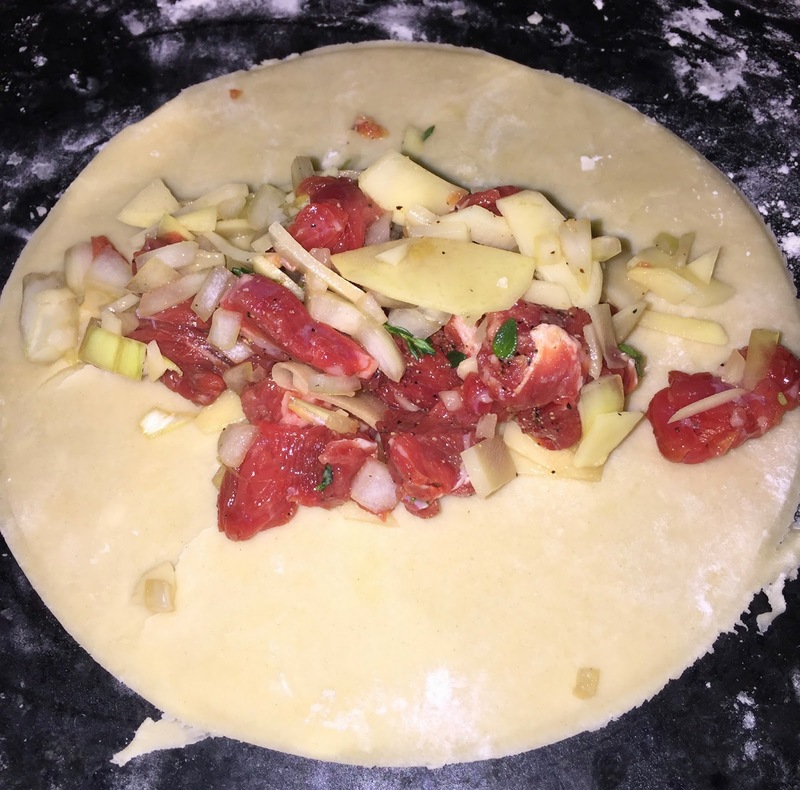 Lay the filling in a line in the center of the pastry dough and then crimp the edges to seal.